Since the end of the Fall season, I can guess that a lot of Sword Art Online reviews are coming out of the woodwork by now. 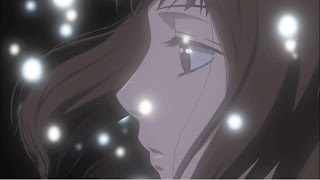 Arkada over at Glass Reflection and Gigurk over at The Anime Zone have both reviewed it by now. But I’m not gonna fall in line with that and do a SAO review! NO WAY!! ............. Mostly cause I still need to get all the bad touch stuff out of my system....... Instead, we’re going with some romance! 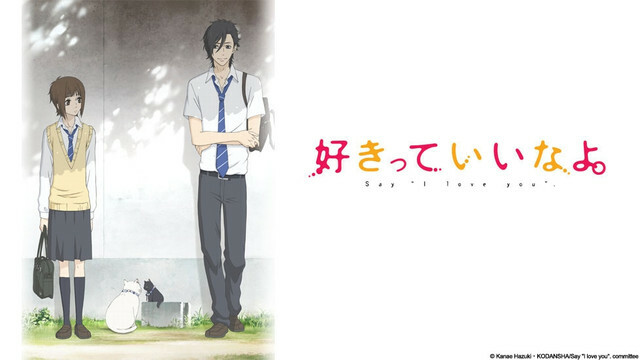 Say I love you is a Drama/Romance series based on the ongoing manga from Kanae Hazuki and published by Kodansha. As of this review, the manga has not been licensed in the states. The anime from director Takuya Sato and studio ZEXCS aired in the fall of 2012. Sentai Filmworks currently holds anime license rights, but has not announced any release dates. ZEXCS isn’t exactly well known on it’s own for anime series. They’ve done more work for other studios rather then for themselves. With title such as Speed Grapher and Mushi-shi, they had yet to branch out as a stand alone studio. The only notable series they did on their own (to my knowledge) was H2O: Footprints in the Sand. So, coming into Say I love you, I wasn’t expecting much. But I gotta say, I’m pleasantly surprised. Animation wise, Say I love you has the look of your typical Shoujo series with the big eyes and fluffy romance you come to expect from the genre. It’s nothing too spectacular but, at the same time, it’s nothing extremely horrendous. The designs are simple and the use of color makes certain moments stand out more and become even more memorable. But I think the highlight of the technical side is the music. A lot of orchestral music can be heard throughout the series and it’s really beautiful. I especially love the opening theme. It’s a lot different the some of the themes from 2012 series where it’s more of a J-Pop/Rock type of feel. Hell, it’s even different from Natsuyuki Rendezvous and I enjoyed that theme immensely (unlike the series itself...). The story, when you get down to it, is a simple high school romance between the popular boy and the rather average girl. They try to make it unique by having our female lead, Mei, have trust issues and being new to love. However, it’s been done before so the chance to be different kinda flops. There isn’t much else to say about the story because all it is is romance in a high school. Even though a good amount of the ideas of Say I love you have been done before, I can appreciate what the series is trying to be: a serious high school romance. No funny business. No jerks for leads. Just an honest to goodness romance. In a sense, it's almost like this sort of innocence about it that just manages to draw the viewer looking for sappy romances in. And I fell for it. I fell for it HARD. This reason is probably why I enjoyed the story despite some of it’s recycled ideas. Ladies and gentlemen, the token big chest girl! There are two major characters in this series since, ya know, it’s a romance. Mei and Yamato are our two love birds that are both fairly new to love. One is the most popular guy in school and the other is socially awkward and starts off with no friends. The story is told through Mei, mostly. We get some time with Yamato, but not enough to really get a better understanding of his character. But, as the series progresses, Mei really grows into her own and starts gaining friends and new experiences that she never had before. And as for Yamato he learns about Mei and how to get to know her without pushing too hard on her. Though he is very much the jealous type. As for the supporting characters, they are just that. Supporting characters. They're there for the two leads whenever it is necessary, especially for Mei. Some of them do have some sort of story line in certain episodes, but that’s about the extent of their development. The series leaves it’s focus on our young couple, and that’s about it. I’m pretty okay with this, but there are a couple characters that I wouldn’t mind seeing more of. For instance we have Asami, a rather bubbly yet self conscious girl who does get teased about her fairly large chest size. And then we have Aiko, another pretty self conscious girl because she goes through a dramatic weight loss and has scars from it. All for a guy. Go freaking figure. And now for the token rival of the main female. Sentai Filmworks has the current license but, as of this review, has not released the series or made a dub. Instead, we're stuck with the Japanese. Yay! The Japanese cast is actually kinda average to me. Maybe because, again, it’s stuff that’s been done before so the acting is going to be rather familiar. Ai Kayano and Takahiro Sakurai play Mei and Yamato well, bouncing off each other in those times when the romance is supposed to have it’s awkward bumps. As for the rest of the cast, the only stand out role would have to be Minako Kotobuki as fashion model Megumi. She has the sass and sweet down for the role, and I did get some enjoyment out of it. After finally confessing my feelings, Say I love you is pretty average for a love story. It doesn’t really try to do anything new, but it also is completely honest with what it wants to do. It’s simple, cute, and even romantic. If you’re looking for something different then a bunch of action or fast paced shows and just want to sit back and relax, then give Say I love you a try. I really did enjoy myself with this series, and am glad I finally found a new romance to enjoy. Since, ya know, Natsuyuki Rendezvous nearly ruined my hopes and dreams. Well, next time, we meet the key to the world... Until next time, otaku on my friends! Teds Woodworking has more than 16,000 woodworking plans with STEP-BY-STEP instructions, drawings and drafts to make all of the projects smooth and easy! New Diet Taps into Revolutionary Idea to Help Dieters Lose 12-23 Pounds within Just 21 Days!